I have a confession…I’m a no frills, no fuss, and fast vegan cook, the majority of the time. Why? Because TIME! I’d love to make my own cheese, dressings, sauce, seitan, etc., but planning, prepping, and wrapping my head around all that is way more than this vegan entrepreneur can handle at the moment. So don’t judge that I rely on some store bought processed ingredients to get dinner on the table. The goal here is VEGAN. Fortunately, we have plethora of vegan products to help us out these days. I keep them in stock so when my world gets out of hand and hangry kicks in I’m prepared. The salad I’m sharing today came about in such a scenario. There is nothing fancy about this salad, but that doesn’t mean it lacked in providing me a hearty delicious vegan meal. I’ll eventually get back to spending more time in the kitchen, that’s where my heart and stomach are most content. In the interim, my meals created on the fly just might turn out to be worthy for you too. If you haven't tried the Mini Crabless Cakes from Gardien, they're a must! The roasted corn delivers a summer sweetness and don't skip on the dill, it brings the whole salad to life. Perfect light but filling meal on a hot night. Follow package directions to cook the Mini Crabless Cakes, or if you have an airfryer cook the cakes at 390 for 6 minutes, shake and then cook another 3. Meanwhile, add a small amount of olive oil to a skillet pre-heated on medium, add the package of frozen roasted corn and heat thoroughly. Remove from stove and let cool. Empty the arugula into large bowl, add the corn, the juice of one medium lemon and mix well. 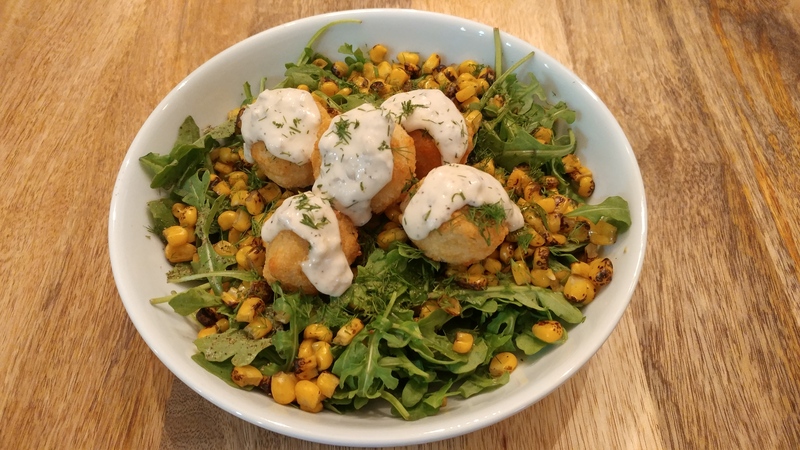 Divide up the Arugula into bowls, top with the desired number of Crabless Cakes, top each cake with a dollop of Tartar Sauce, sprinkle generously with fresh Dill.